If there was a vegetable I wasn't fond of, it was red peppers. I could handle all other colors except red for whatever reason. But that was years ago and my tastes have changed. Now I've come to appreciate the sweetness of these peppers along with how beautiful their color is when used in recipes. 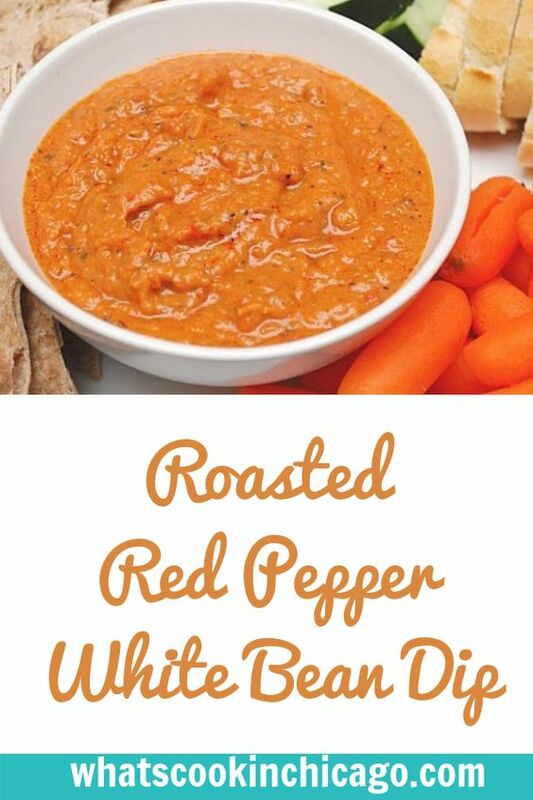 I used red peppers to make this dip which went along with our Mediterranean inspired Superbowl menu. It couldn't be any easier to take a few simple ingredients, give it a whirl in a food processor and serve up for guests! Even though we weren't doing traditional game day fare for the Superbowl, I wanted the dishes on the Mediterranean inspired menu to be slightly reminiscent of game day food. This one reminded me of a traditional red salsa... only instead of tomatoes, roasted red peppers to center stage. I found this recipe from fellow blogger, Closet Cooking and really liked how it has a salsa consistency. To serve, I provided a few dippers including baby carrots, cucumber slices, whole wheat pita triangles and toasted baguette slices. Combine beans, peppers, garlic, lemon juice and zest, oil, oregano, and black pepper in the bowl of a food processor fitted with a metal blade. Process until smooth then transfer contents to a small bowl. Season with additional salt & pepper to taste if needed. Stir in the crumbled feta and serve.